Through hands-on activities, activity demonstrations, case studies, and video clips you will walk away with evidenced-based strategies and motivational activities that will facilitate your student’s unique growth patterns in all areas of learning, at all skill levels. Learn how to integrate animal-assisted therapies (with a focus on hippotherapy) and iPad® technologies to promote engagement, communication, and motor skills. You will end the program with a collection of intervention tools that increase student engagement and motivation in order to promote therapeutic/ educational objectives as well as adaptations that make the activities accessible for children with physical disabilities. Because having fun is a critical aspect of all learning, be prepared for a multi-sensory experience that will activate your smile muscles. It is very rewarding and gratifying to know that you will be able to take these ideas back to the members of your team to implement and effectively serve children. Multi-disc DVD recording (6 hours, 22 minutes) with electronic manual and instructions. Describe key types of activity adaptations that promote cognitive, sensory-motor, social-emotional, communication and play skills. Explain the benefits of various evidence-based and anecdotally supported interventions when working with developmentally delayed children. Discuss the use of iPad® apps to promote cognitive, motor, communication and daily living skills. Determine the role of animal-assisted therapies in supporting children with disabilities and its role in various therapies. Design supports, adaptations and activities for students with functional vision challenges. Plan age-appropriate pre-vocational activities for older students. Barbara A. Smith, MS, OTR/L, is a highly experienced occupational therapist, author and national presenter who has over 30 years of experience working with children and adults with developmental and learning disabilities in a variety of settings including public schools, educational collaborative, group homes, early intervention and hippotherapy programs. She is the author of four books, including The Recycling Occupational Therapist; From Rattles to Writing: A Parent’s Guide to Hand Skills, which won a 2012 National Association of Parenting Publications Award (NAPPA) (Therapro, Inc, 2012); and The Almost Complete Plastic Bottle Activity Book (Amazon Kindle, 2012). She is also the designer of the patent pending fine motor activity, Weavable Toys: Basic Shapes. Barbara earned her B.A. in English from State University of New York at New Paltz and her M.S. in Occupational Therapy from Tufts University. She is certified in Sensory Integration evaluation and interventions and certified by the American Hippotherapy Association in hippotherapy. Financial: Barbara A. Smith is the owner of Recycling OT, LLC and created Weavable Toys: Basic Shapes. She is the author of the self-published book “Still Giving Kisses: Guide to Helping and Enjoying the Alzheimer's Victim”. She is the author of the Kindle published book "The Almost Complete Plastic Bottle Activity Book". She receives royalties as an author for Therapro, Inc. and Therapy Skill Builders. She receives a speaking honorarium from PESI, Inc. 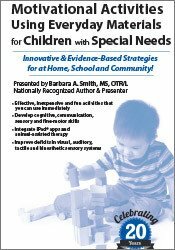 Non-Financial: Barbara A. Smith is certified in Sensory Integration and is also certified by the American Hippotherapy Association.